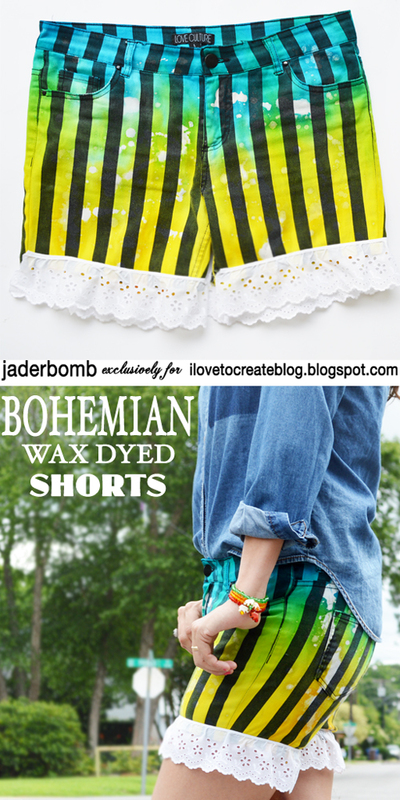 I am so excited to share with you these fabulous Tie Dyed Shorts I created for the I love to create blog. I first started the project with intentions of just tie-dying but one thing led to another and next thing I knew lace made it’s way into the picture. Let me know if you like the colors, lace or the stripes. These are really versatile and you can wear them with so many things. I also believe the process of how I made these can be used for so many other projects depending on your mood. Don’t forget Orange is the New Black premiered today so make sure to check it out on Netflix! Check out this tutorial I made for the new season! You will love it. DID YOU HEAR THE GREAT NEWS THAT I ANNOUNCED YESTERDAY?